Lightning McQueen Cars Cupcake Recipe #Cars3 | Be Plum Crazy! 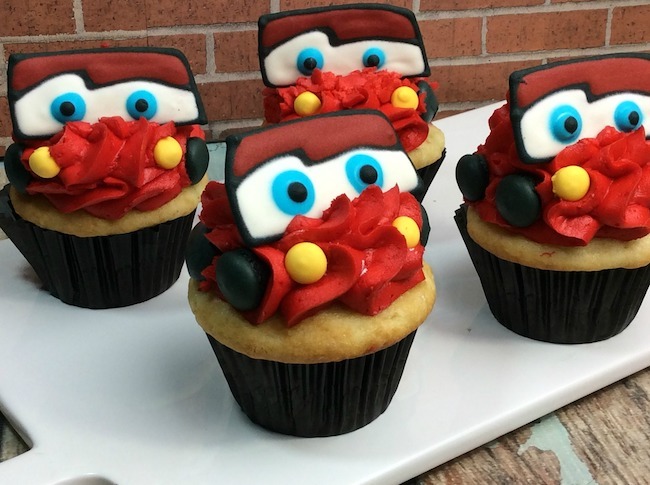 Lightning McQueen Cars Cupcake Recipe! Who doesn’t love Lightning McQueen from Cars 3? Everybody does! 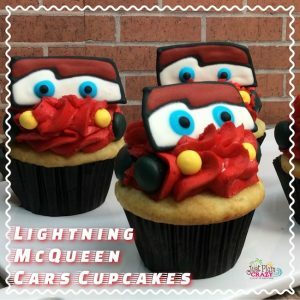 So why not make some cute Lightning McQueen Cars Cupcake recipe to go along with the movie that came out this past week. The kids will love them as well as the adults. Don’t let the list of ingredients and directions scare you away. 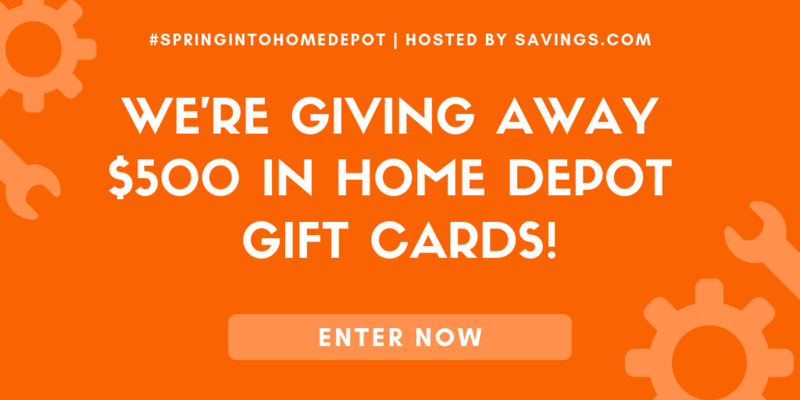 I just wanted to give you the step by step to make it easier for you to make them. You could even use canned frosting and store bought cupcakes if you wanted to. Let’s get baking! 1. Locate the image of Lightning McQueens eyes on google and print it out. 6. Using the standing mixer, combine the powder sugar, egg whites, cream of tarter and vanilla and mix on medium speed. 7. If the royal icing is still a yellow soup, add in 1/2 C powder sugar. 8. Continue to mix until you get stiff peaks. 9. Evenly divide the icing into the five bowls. 10. Add a few red drops into the first bowl and mix until combined. 11. Add a few more drops to get the shade of red that you want. 12. Add a few blue drops to the second bowl. 13. Add a few yellow drops to the third bowl. 14. Add a few black drops to the fourth bowl. 15. Leave the white icing in the fifth bowl white. 16. Scoop the icing colors into a piping bag. 17. Using the black icing, outline the place lines on Lightning’s eyes. 18. 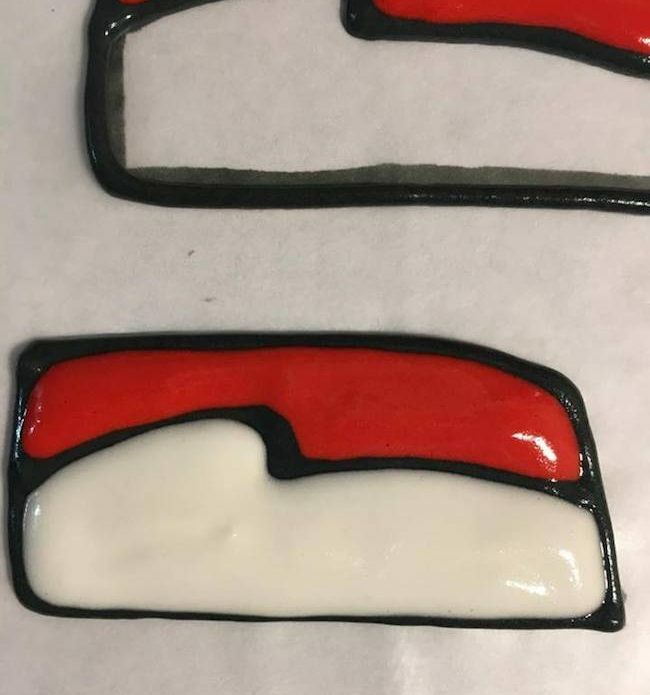 Using the red icing, fill in the top part red. 19. Using the white icing, fill in the bottom part white. 20. 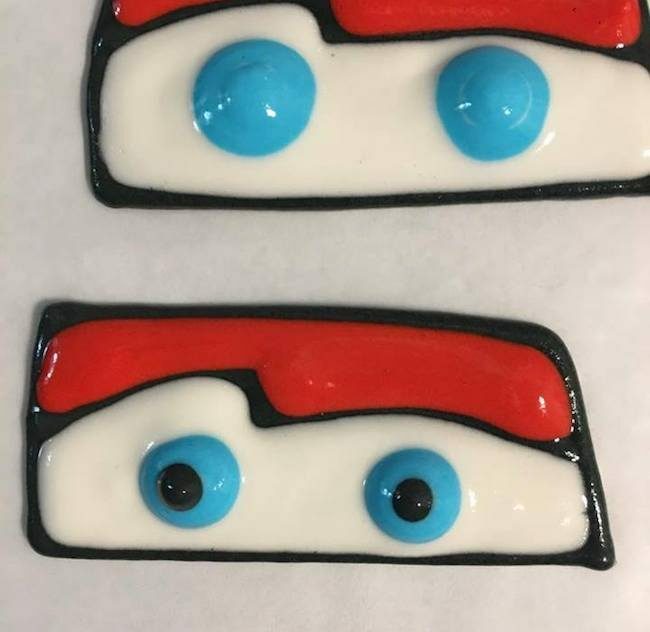 Using the blue icing, add two blue dots for his eyes. 21. 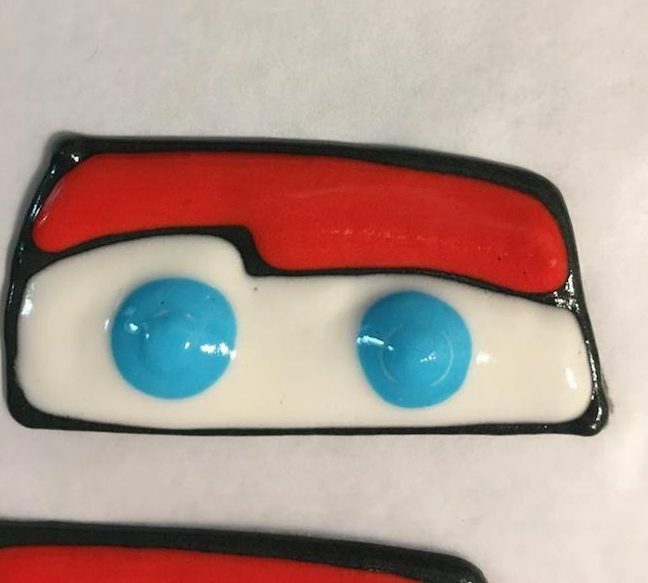 Using the black icing again, add a dot into the center of the blue dot for his pupils. 22. 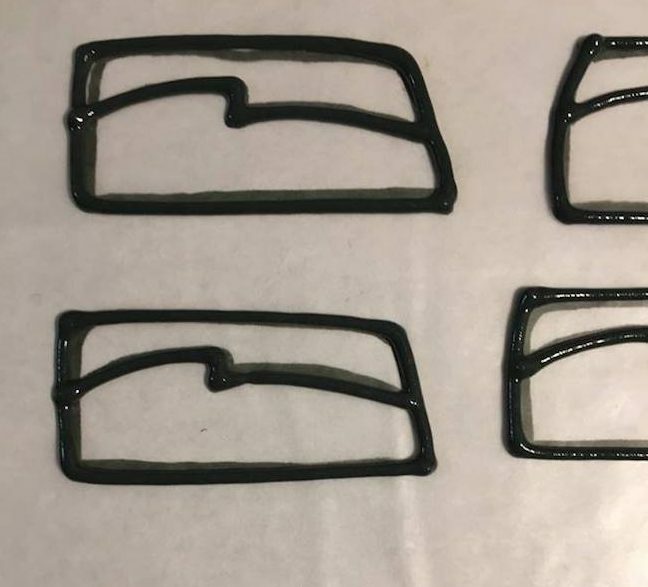 Using the yellow icing, below Lightnings eyes on a empty space on the cookie sheet, pipe on 24 small yellow dots for Lightning’s headlights. 23. Using the black icing, pipe on 48 medium sized black circles for the tires. 24. Set aside for 1 day to dry. 1. Preheat oven to 350 and line cupcake pan with the liners. 2. In a medium bowl, combine the cake mix, butter, milk, and vanilla bean pasta and mix until combined. 3. Using a medium ice cream scoop, scoop the batter into the cupcake liners and fill about 3/4 of the way full. 4. Bake in the oven for about 21 minutes. 5. Pull out and place on the side to cool. 1. Using a standing mixer, combine all ingredients except the food coloring into the bowl and mix on medium speed. 2. If your frosting starts looking like powdery rocks, add another tablespoon of heavy whipping cream. 3. Mix until you see creamy stiffed peaks. 4. Separate the frosting into three bowls. 5. Add red dye into the bowl and mix until combined. 6. 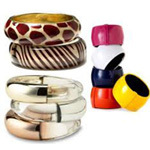 Add a few more drops in to get a bright red. 7. Fit the star tip into the piping bag. 8. Scoop the red frosting into the piping bag. 9. Twist the top of the piping bag and squeeze the frosting down. 10. Take your cooled cupcake and frosting the cupcake from the outer edge. 11. Gently peel off Lightning’s eyes and place onto the top center of the cupcake. 12. Add two yellow dots below his eyes, in the corner for the headlights. 13. Add 4 black dots, 2 on each side, for tires. 14. 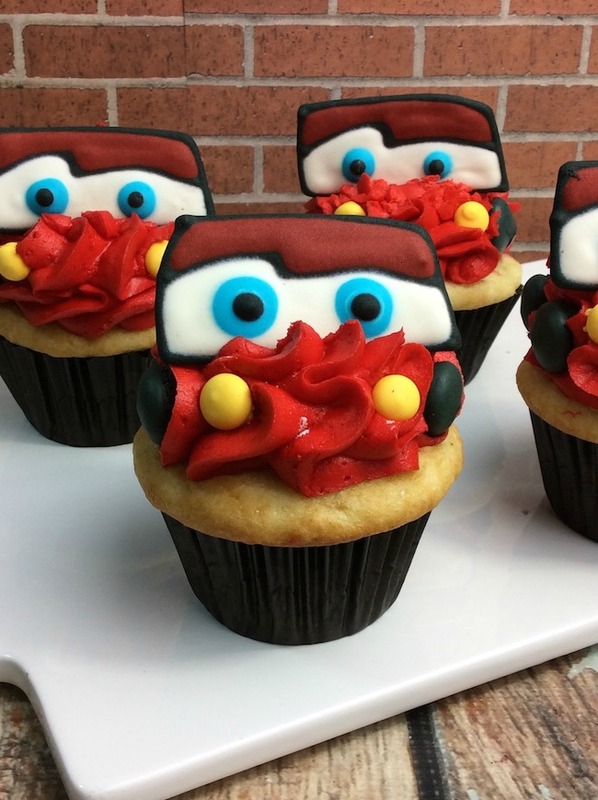 Enjoy your Lightning McQueen Cars Cupcake recipe! Add a few red drops into the first bowl and mix until combined. Set aside for 1 day to dry.